Doha, Qatar, 07 August, 2018: As a progressive leader in Corporate Social Responsibility (CSR) and socially responsible business practices, Qatar Insurance Group, the leading insurer in Qatar and the MENA region have collaborated with Dreama to provide sponsorship for quality housing refurbishment for orphans. QIC Group has long focused on engaging in multiple CSR collaborations that make significant developments in the fields of human and social development. Evolving with the trends that underpin the changing CSR landscape in Qatar, QIC Group has been involved in various activities that contribute to the advancement of the society, including cultural, social and human values that create scalable impact. Today CSR is considered an integral pillar for achieving sustainable development; not only in business, but also in the society it operates in. In fact, QIC firmly believes that engaging with the society through various CSR initiatives is a two-way process. First is when the organization benefits from a business perspective and second, when the company gives back to the community in a variety of ways, developing strong relationships and building trust. On behalf of QIC Group, Mr. Ali Fadala, Senior Deputy Group President & CEO of QIC Group handed over the sponsorship cheque of QAR 800,000 to Mohammed Al Khanji from Dreama. 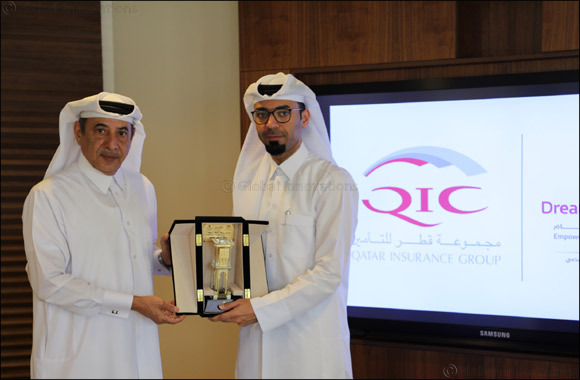 With this sponsorship, QIC Group will continue to move steadfast on its CSR initiatives and fulfil its goals for achieving sustainability. Thanking Qatar Insurance Group for their support, Ms. Maryam bint Ali bin Naser Al-Misnad, Executive Director of Dreama Orphans Care Center stressed that the responsibility towards the community and its various groups, including orphans, is one of the pillars of social responsibility for institutions operating in Qatar. Adding that Dreama’s objectives are realised through an effective community partnership with all sectors in Qatar, she confirmed that QIC Group’s sponsorship had opened doors for consultation on the situation of orphans in Qatar. In addition, it would also assist in transforming their everyday life whilst satisfying their psychological, social, educational and scientific needs through developing play and learning units. The generous support from QIC Group emphasizes Dreama’s role in supporting and improving the housing facilities for the children of the Centre. This aspect is important in terms of the stability of its children in a secure and stable environment and achieving the strategic objectives of Dreama.